1, 2, 3 Bean Chili! Chili is by far one of my favorite fall meals. It is warm, homey, spicy, and super easy to make! I’ve made all kinds of chili’s before: black bean, white bean, three-bean, lentil, and more. 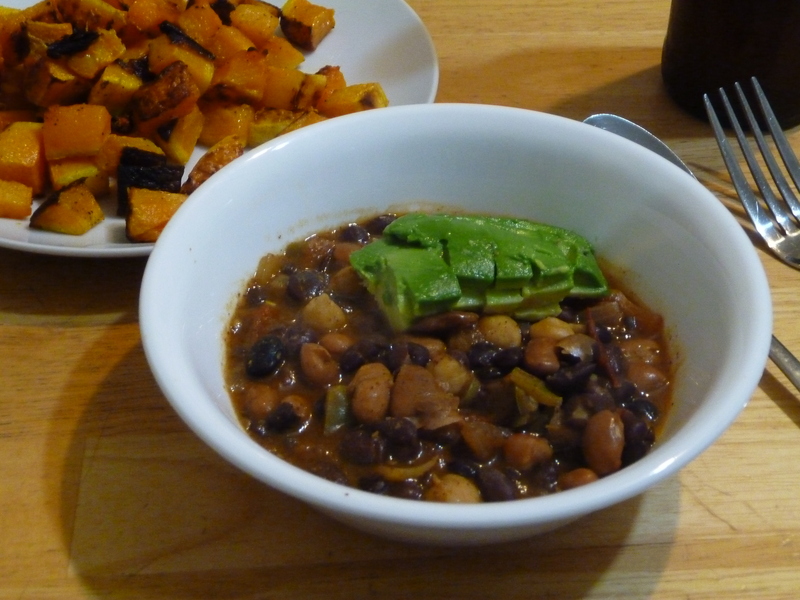 Last week I threw together a version that used up all the beans that were hanging out in the freezer and fridge, and it came out delicious, even with this random variety of beans. So, I figure you could make it with any kind of bean you wanted – all black, some kidney and some chickpea, or some other inventive combo. I hope you enjoy it as much as my family did! 4 and a half cups (equivalent to 3 cans) of beans (For my last batch of this I used 2 cups of black beans, 1 cup of chickpeas, and 1 cup of kidney beans). Saute the onion and bell pepper and jalapeños in the olive oil until the onion is translucent (about 5 minutes). Add the spices (cumin, chili powder, cinnamon, cayanne) and cook for 1 minute more. Add in the beans and tomato. Bring to a boil, then turn heat to medium low. Simmer for 20-30 minutes. Add salt and pepper to taste. Serve warm topped with avocado! Even better, add in some cornbread and beer for a fantastic fall dinner!